Stephen Schaffner is a senior computational biologist in the Infectious Disease and Microbiome Program at the Broad Institute, where he studies the genetics of human infectious disease, including host, viral and malaria genetics. He has worked extensively in human population genetics, contributing to the first systematic study of human genetic variation, to the International HapMap Project and to the 1000 Genomes Project. He has developed techniques for detecting the effects of positive selection on genetic variation, carried out model-based studies of human demographic history, and developed tools for identifying recent common ancestry in malaria parasites. 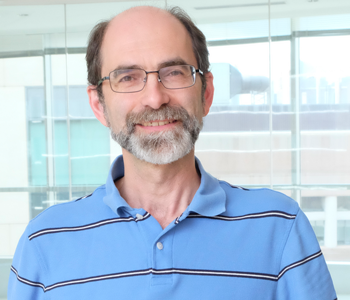 Schaffner is a former experimental physicist who joined the Whitehead/MIT Center for Genome Research in 1999, and became part of the Broad Institute at its founding. He earned his Ph.D. in physics at Yale University. Diehl WE, Lin AE, Grubaugh ND, Carvalho LM, Kim K, Kyawe PP, McCauley SM, Donnard E, Kucukural A, McDonel P, Schaffner SF, Garber M, Rambaut A, Andersen KG, Sabeti PC, Luban J.
PNAS 111 (4), E455-E464 (2014). O Zuk, SF Schaffner, K Samocha, R Do, E Hechter, S Kathiresan, MJ Daly, el al. Nature 467 (7319), 1061-1073 (2010). Nature Genetics 39 (1), 113-119 (2007). SK Volkman, PC Sabeti, D DeCaprio, DE Neafsey, SF Schaffner, et al. Science 312 (5780), 1614-1620 (2006). PC Sabeti, SF Schaffner, B Fry, J Lohmueller, P Varilly, O Shamovsky, et al. Calibrating a coalescent simulation of human genome sequence variation. Genome Research 15 (11), 1576-1583 (2005). SF Schaffner, C Foo, S Gabriel, D Reich, MJ Daly, D Altshuler. Nature 426 (6968), 789-796 (2003). RA Gibbs, JW Belmont, P Hardenbol, TD Willis, F Yu, H Yang, LY Ch'ang, et al. Science 296 (5576), 2225-2229 (2002). SB Gabriel, SF Schaffner, H Nguyen, JM Moore, J Roy, B Blumenstiel, et al.